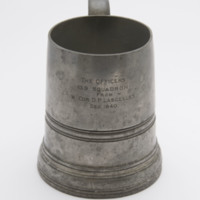 Pewter tankard with glass bottom. Inscription reads: 'THE OFFICERS 139 SQUADRON FROM W/CDR. D. P. LASCELLES. DEC. 1940.'. 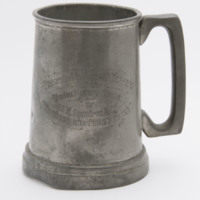 Pewter tankard with glass bottom. Inscription reads: 'Presented by Aircraft Workers of the Shadow Factory Speke to 139 (B) Squadron R.A.F. “To those who finish the job” '.